Cheese put in a bowl and mash. Add to it the sugar. Mix everything carefully. Separately, beat egg whites and yolks. To proteins while beating, add a pinch of salt. Mix with curd yolk, flour and vanilla (or vanilla sugar). Then add to the mass of the protein and gently mix it all together. The result is a homogeneous, dense, thick mass. Dried fruits to be soaked in boiling water for 10 minutes. In order not to violate the consistency of the finished mass, of raisins and dried apricots need to remove the water. This will need to spread the dried fruit on a napkin and DAB on top of another napkin. After that dried apricots should be cut into pieces. 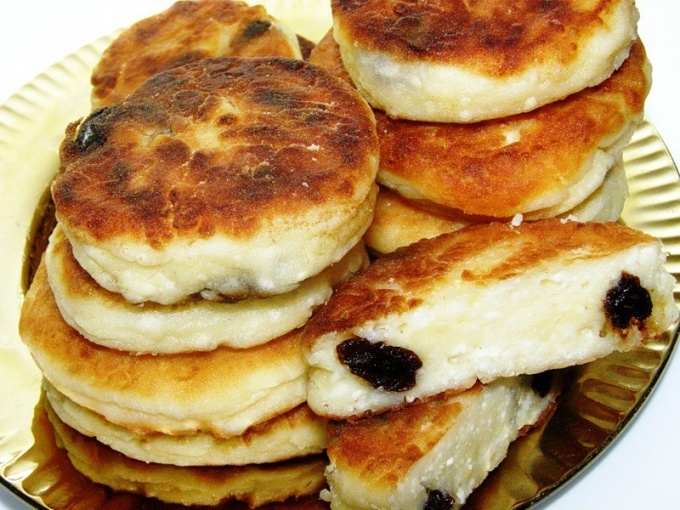 Dried fruit stir in the mass of curd. You can start modeling! For this you Need to spoon the cheese, roll this portion in flour, slightly flatten and place on parchment. The pan with the curd is put in the oven for 25 minutes at a temperature of 180-200 C.
The curd can be cooked in the oven, and vegetable oil in a frying pan. In ancient times people noticed that the heat treatment of the proteins in the cottage cheese makes it difficult to digest. Therefore cheese to make one of the most beloved Russian, Belarusian and Ukrainian dishes - curd - steel grind through a sieve. The curd become lush and supple! You can also try to grind cheese or do you choose in the shop to prepare the curd soft and dry variety.